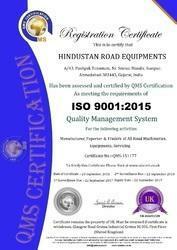 We, Hindustan Road Equipments, commenced our functioning in the year 2007, as an exporter and trader of this impeccable range of Road Construction Equipments. The highly praised and preferred range comprises Asphalt Drum Mix Plant, Asphalt Hot Mix Plant and Drum Mix Plant. These products offered by us, are known for their commendable performance, long functional life and impeccable sturdiness it provides. Manufacturing of this range is done in accordance with the set industry norms and guidelines, by trusted vendors, utilizing the finest raw materials and modern machines. In addition to this, the offered range is priced at the most affordable rate possible. We export our products globally. We have a highly futuristic state-of-the-art warehousing facility at Hindustan Road Equipments. The facility is equipped with all the required machinery and instrument, help us attain a number of the firm’s predefined targets. For the purpose of attainment of finer and smoother management of the firm’s operations, the facility has been compartmentalized. The facility spreading over a wide area of land is highly spacious in nature. To preserve the goods for a longer period of time, the facility has been designed in a manner, that it is resistant to fire, flood, rain and earthquake. Further, our highly ethical working habits and following of the industrial guidelines has helped gather a huge client base. 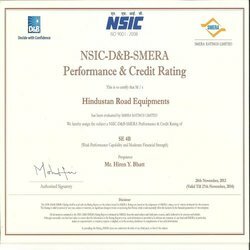 Under the guidance and supervision of our proprietor Mr. Hiren Y. Bhatt, we have managed to reach greater heights of success. His knowledge of the domain, managerial skills and ability to determine market changes, has been an asset to us. Further, he takes special care of the employees’ satisfaction, by offering timely increments, incentives and promotions to the disserving candidates. 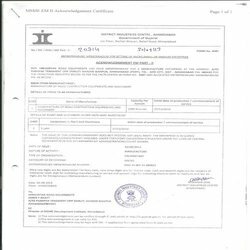 We are an SSI Certified Company. We are an NSIC Certified Company. Our team of highly dedicated experts, help us in the attainment of several of the firm’s predefined goals and objectives, in the most efficient manner possible. The team is recruited based on the professional’s skills and experiences. For reasons of attaining smoother and effective management of the firm’s operations, the team has been sorted into a number of highly operational units, which are under the leadership of skilled managers. For reasons of keeping the professionals at par with the market changes, regular training sessions are provided. The finest range of Road Construction Equipment is exported and traded by us. To maintain this reputation, we procure our products from vendors, to whom quality is of high importance. Thus its manufacturing involves the utilization of high grade raw materials and modern machines, in compliance with the set industry norms and guidelines. This ensures the product’s performance, service life, strength, precision and capacity. In addition to this, the offered range is known to be marked at the most reasonable rate possible and delivered with high level of punctuality.